After months of stalling, Gerinda and the Prosperous Justice Party (PKS) have finally screened three candidates to fill the Jakarta deputy governor position, which has been left vacant for half a year. 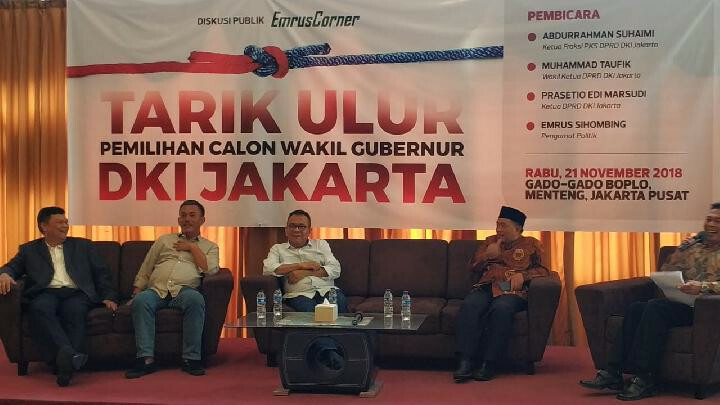 The eight-hour screening of Akhmad Syaikhu, Agung Yulianto and Ahmad Suhaimi – all PKS politicians – was held behind closed doors on Sunday at the Aston Priority Simatupang Hotel in South Jakarta. “[We] apologize that it was closed [to the media]. Moreover, the agenda took a long time,” PKS Jakarta spokesperson Zakaria Maulanan Alief said on Sunday as quoted by tempo.co, adding that his team would issue a press statement after the screening was finished to avoid public uproar. Each candidate was reportedly required to present their ideas on city development and was quizzed on their understanding of the city’s mid-term plan. During the first phase of the screening, each candidate was given individual time to present their ideas before being questioned by a four-man panel. In the second phase, all three candidates were presented together before the panel. The four panelists were: Indonesian Institute of Sciences (LIPI) political observer Siti Zuhro, University of Indonesia public policy expert Eko Prasojo, Jakarta State University political observer Ubedilah Badrun and Gerindra's Ahmad Sulhy. The names of the top two candidates would be submitted to Jakarta Governor Anies Baswedan before they were proposed to City Council.